Your biggest business accelerator is a professional sales training system. Most companies view product training as sales training, but it isn’t. Sales training is about systems, tools, scripts, approaches, conversation starters, personal brand, negotiating skills, and other skills that transcend product features, advantages, and benefits. And it will substantially increase your profits. For example, if through value-based selling and upgraded negotiating skills your sales team can decrease average discounts by just two percent, for a 20 percent gross margin business you’ll can boost profits by 10 percent without selling one dollar more. 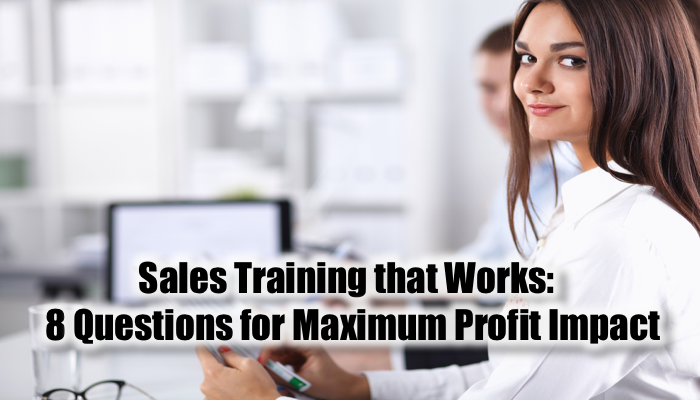 Creating a sales training system must be done with deliberation and forethought. Notice that none of these questions talks about HOW the training will be accomplished as that isn’t relevant until you set your strategy. 1) What sales culture do you want to instill and perpetuate? This determines the sales style and training system. Getting this right is the basis of a scalable, sustainable, profitable business. Get this wrong and your sales process will be a mess. 2) What is the lifetime value of customers? How can you increase this by just 10 percent? This justifies the investment for the training culture and system and provides rapid payback for the investment. 3) What level of technology acumen and business acumen do your customers expect to consider your sales team to be a person of interest? This determines the topics and skills that must be taught, reinforced, and managed. More business knowledge means higher and more strategic access within the customer organization, resulting in bigger deals and stronger customer loyalty. 4) What is the skill set and attitude set of the current sales force compared with the desired culture? This determines the transformation path to be designed and delivered. The journey to upgrade a sales team can be highly disruptive or smooth and deliberate, based on the transformation path design. This is the step that most sales training systems ignore. 5) What is the mix between high-consideration, long sales cycle products and low-consideration, short sales cycle products? This determines the focus of the sales strategies and tactics because each of these two processes and compensation plans are very different. Most sales issues that I see come from using low-consideration sales methods for high-consideration deals. 6) What is the mix between inside sales, outside sales, and technical sales support? How does each maximize the customer connection and deal velocity? How do they best interact to present a commanding presence with the customer? This determines the sales training tracks for the different sales role within your organization as when it comes to sales training, one size does not fit all. Most sales training programs only focus on one of these roles and sales strategies. Creating an integrated system delivers the rapid outcome you need for long-term scalability and success. 7) What is the connection between marketing strategy and sales strategy? How can the sales training system reinforce and optimize marketing strategy? This optimizes your marketing investment, which drives future sales if your team can convert the conversation to a transaction. Many companies have massive inefficiency in the interface between marketing and sales. Here’s a video on how to improve the sales and marketing relationship. 8) How will you know who to choose to help you design, package, deliver, and maintain your sales system? Make sure that they know the difference between high-consideration sales strategies and low consideration sales strategies, as they are very different. I’m open for conversations around any of these concepts. If you’d like 30 minutes to talk about how to build your customer acquisition system, go to MarksSchedule.com to set up time to meet.